Much has been written about the assimilation of German Jews before 1933 trying to explain why so many did not leave Germany, their country. Many German Jews were unable to imagine the unspeakable harm they would suffer under the Nazis. Whether that assimilation was a one-way street or true integration, is a debate among historians. Yet, what I can observe from the food point of view is that it must have been assimilation to a very high degree. When I could not find more typical German-Jewish dishes in other contemporary cookbooks neither, I went back to the oldest original source I could get my hands on: the 13th edition of the Kochbuch für israelitische Frauen (Cookbook for Israelite Women) by Rebekka Wolf from 1912. First published in Berlin in the mid 1900s, it was the most popular German-Jewish cookbook for decades. From the chapter on breads, you would also not be able to tell that this is a German-Jewish cookbook – if it wasn’t for the first two recipes in the baking chapter – Berches. I had never heard of Berches until earlier this year when I came across the blog German-Jewish Cuisine by Gabrielle Rossmer Gropman and Sonya Gropman, a mother-and-daughter team who wanted to create a forum about the foods of German-speaking Jews in Europe. 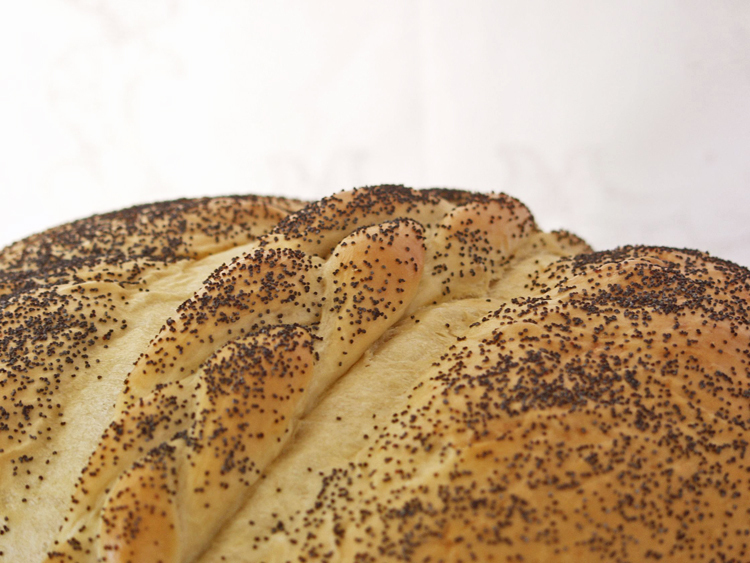 Berches is sometimes referred to as the “German challah” but it is different. Unlike challah, the dough does not contain eggs, and cooked potato is added to the dough. I baked my first Berches last weekend. And I added another twist, literally. In the German town of Walldorf near Heidelberg (the most prominent American immigrant from Walldorf was John Jacob Astor whose origins and name were incorporated in the name of the Waldorf-Astoria Hotel in New York City), a group of people came together a few years ago to learn how to make Berches. Families in Walldorf still used to bake Berches in the 1950s and 1960s but with the generation of women who had learned how to bake Berches from their Jewish neighbors dying out, this tradition had disappeared. In the Walldorf version of Berches, a small braid is placed on top of the loaf and tucked underneath. Yesterday was the first day of Hanukkah. My Jewish-American husband never asks me to make special foods for Jewish holidays, with the exception of latkes for Hanukkah. 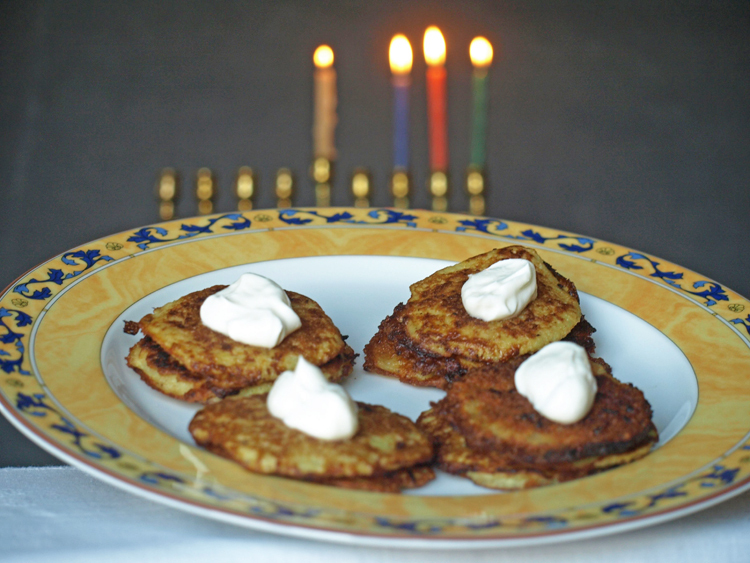 As I grew up on Kartoffelpuffer (German potato fritters) made by my grandmother year-round, and they were one of my favorite foods as a child, I gladly make them for Hanukkah every year. Whatever you call those crisp fritters, for me they represent, like no other food, the crossover of German and Jewish food traditions. Categories: Uncategorized | Tags: cookbooks, cooking, food, german cookbook, german food, german jewish cuisine, german jews, germany, hannukah recipes, hanukkah, jewish cuisine, jewish holidays, jewish recipes, recipes | Permalink.